12 Pieces Switchable Patterns: 5 pcs Christmas/New Year themes, 1 pcs 2018 New Year theme, 2 pcs Halloween themes, 1 pcs Thanksgiving Day themes, 1 pcs birthday theme, 1 pcs snowflake and 1 pcs Sichuan facebook themes. A great project lamp help you create festival atmosphere by displaying fun, festival and interchangeable images.Transform any area from ordinary to EXTRAORDINARY. Brighter & Further: 8W high power white LED beads. This LED Projector Light is equipped with 4 pieces high power LED beads, which can project brighter and clearer pattern at 1.6-26 feet distance and cover 43-322 square feet area! Energy saving, no laser, no harm to eyes that compared to laser projection lighting. Unique and creative manual control button:The power button is designed to be on the bottom, with waterproof cover, which means it has a better waterproofness meanwhile it is easier to operate without shaking easily compare to other projection lights with power button on the side. Press the button can switch the modes between slow rotating, fast rotating, still, slow flash + slow rotating and fast flash + slow rotating. Easy to Use: Variety of accessories: 5 meters power cable, spike and base. This projector light can be fixed on the wall/ceiling with screws or directly plugged in garden lawn without tools needed. The light head is 180 degrees rotatable, more convenient to use. 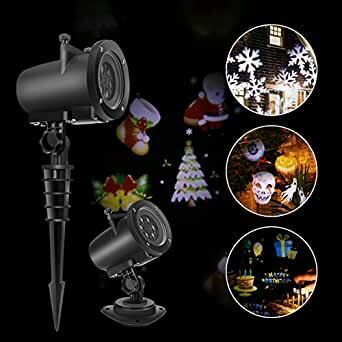 Widely Application:IP65 waterproof, you can use the projector lights indoor or outdoor.Great for Christmas, New Year, Halloween, Thanksgiving, birthday party and holiday decoration, add charming and warm atmosphere to home, stage, garden, patio, lawn, porch, gate, yard, landscape, etc. Healthy soft LED light, can protect your eyes. LED light are widely used in household and building decoration; Classic style with a unique effect gives it distinctive characteristics. Wall decoration light, moving automatically, take more fun for your party, festival and family party. Working environment: indoor and outdoor, Christmas tree or Halloween Illuminations, Showcase or Window displays, Home or Garden Decorations; Wedding and etc.